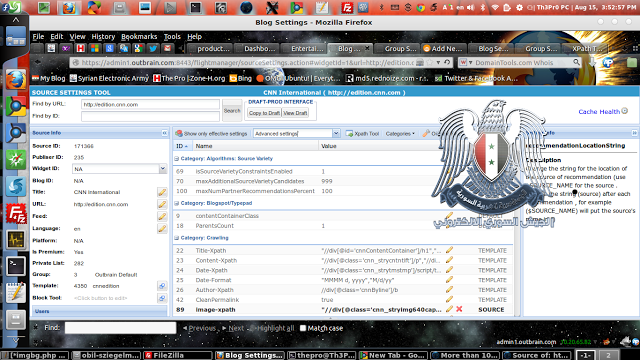 Once again Syrian Electronic Army hits the cyber space with its logo. After hacking the major organisation twitter accounts including FIFA, The Guardian, AP and some major sites of True caller, Viber apps, SEA hackers have hacked the content recommendation service name as Outbrain. Hackers have breached the security of the Outbrain service and gain access to the admin panel. Outbrain help internet publishers to increase web traffic at their websites, by presenting the links to the article as like related with it. As per the EHN, Hacker claimed to have gained access to the Outbrain site admin panel which is hosted in the local server, with the help of VPN. Now the site is working fine as Outbrain team have managed to restore it. The security breach affects CNN, Washington Post, Time and more high profile websites.